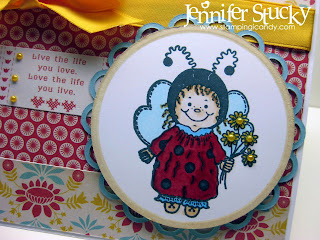 Sharing a sweet little ladybug image today. Isn't she just so hugable? She's sure to bring someone special a smile! I colored her up with my Copics on a circle Nestie and sponged around with Antique Linen ink. For extra dimension I popped her on a Lacey Nestie. to add a touch of sparkle. Lastly, I tied on a matching silk bow. All the papers are from the Cosmo Cricket new line - Baby Jane. Even the sentiment is from the Baby Jane DP. Have you been to our new store? 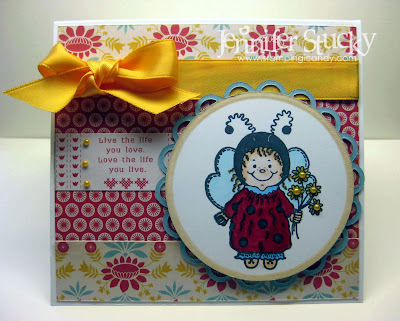 Come take a peek...Great Impressions Stamps has something for everyone! And now you have a choice...wood or clingable. Both with the same wonderful quality rubber! Very cute card! That image is adorable and I love the tiny pearls you added. Love the yellow...sky's were gray here today...cute card, Jenny! The pearls made the card pop! So sweet! love the paper and color scheme too!